One of my goals for the New Year was to knit from my stash and finish projects that I have the yarn for. That's still my goal and I'm off to a good start, but I'm giving myself permission to indulge in one project that's been on my mind for quite a while. 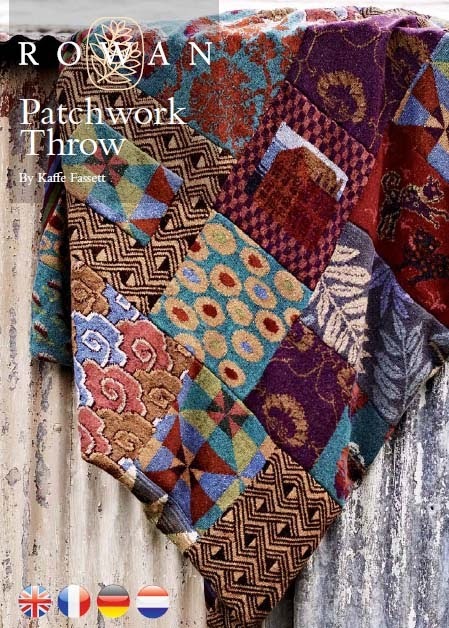 It's the Jubilee Throw by Kaffe Fassett and knit in Rowan yarns. The picture and description is in Rowan 52, pages 26 and 27. The pattern is available to Rowan members online. The only reason I hadn't started the knitting is that I wanted to give some thought to my choice of colors. As much as I like the afghan, I didn't want such a dark afghan. Then, today, I saw this version, click here. I love the colors and the brightness of the afghan. To quote an often-used phrase, I was smitten. Update: I just learned that the afghan I liked used the same colors as in the Rowan pattern. I'm guessing that photography and lighting have a lot to do with my perceived differences. I'll go with the original colors as I do love this afghan. Rowan is my favorite yarn company, has been since I discovered them in the late 1980s, and Kaffe Fassett is one of my favorite designers. I'm lucky enough to have all of the Rowan magazines and plan to make more projects from them if I can...a least one from each issue. For issue 52, this will be my choice. It's going to be a long, slow knit, I'm sure. First, I'll check my stash for any Rowan Felted Tweed DK. I'm sure that there must be some. Then, I'll gradually get the yarn I need to complete a square, one at a time. I'm in no hurry. It's going to be fun to knit some of Kaffe's designs without having to knit an entire sweater. I can't wait to get started. I ♥ intarsia.